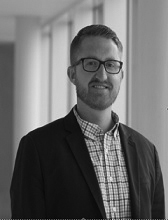 Dr. Jeff Gruenewald serves as an associate professor in the School of Public and Environmental Affairs (SPEA) at Indiana University Purdue University Indianapolis (IUPUI). He received his Ph.D. in Criminal Justice from Michigan State University in 2009. That same year, he also became a START Center co-investigator for the U.S. Extremist Crime Database (ECDB), an open-source database on violent and financial crimes committed by domestic extremists. Gruenewald also serves as co-investigator for a series of past and current projects funded by the National Institute of Justice (Department of Justice) using data from the American Terrorism Study (ATS) to examine patterns of domestic terrorism. Some of his current research interests include the comparative nature of far-right and Al-Qaeda-inspired terrorism, extremist violence against law enforcement, and the longevity of terrorist groups and lone wolves operating in the United States. His research has been published in scholarly journals, such as Terrorism & Political Violence, Studies in Conflict & Terrorism, Crime & Delinquency, and Justice Quarterly.